Head out with confidence! All the same marine and lakes content and advanced features found in Navionics+ for GPS plotters are augmented with 3D View, satellite overlay and panoramic photos to provide the ultimate situational awareness. Designed with the most demanding boaters in mind, these additional viewing options can be used on a growing number of GPS plotters. We make thousands of edits every day, so you can always have the most current charts. Daily updates and advanced features are included for one year. Platinum+ XL3 size charts have a wide coverage with all the valuable Platinum+ features. Australia East. From Cape York Peninsula to Bass Strait, Tasmania. 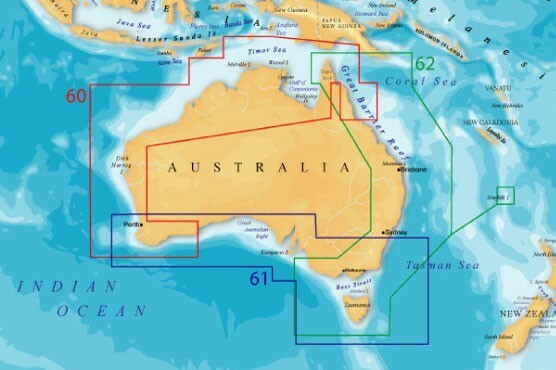 Including Furneaux Group, Lord Howe Island, Great Barrier Reef, Coringa Islands, Brisbane, Sydney, Deboyne Islands, Milne Bay, Melbourne and Norfolk Islands.